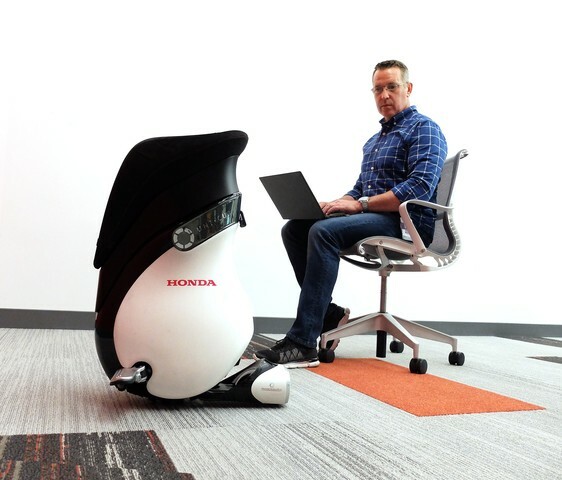 The UNI-CUB (world.honda.com/UNI-CUB), Honda’s unique self-balancing personal mobility device, will be featured at the upcoming Shape: An AT&T Tech Expo in San Francisco. Highlighting the UNI-CUB’s appearance will be its participation in the Honda Developer Studio (https://developer.hondasvl.com/) Hackathon July 15-16 at AT&T Park. During the Hackathon, software developers from across the globe will compete to develop unique software enabling UNI-CUB to be operated remotely beyond its current scope of operation. Developers will have 24 hours to conceive their new ideas for UNI-CUB, with the top 20 teams pitching their ideas live before a panel of judges. The Hackathon begins at 6:00pm Pacific on July 15. Modified with a Robot Operating System compatible API, this special version of the UNI-CUB will be available during the AT&T Tech Expo for programmers to create software that controls the device from a smartphone and other devices. This will expand upon the original UNI-CUB’s system, which currently allows the rider, sitting on a seat, to control speed, move in any direction, and turn and stop, all by simply shifting his or her weight. Since the rider can freely move forward, backward, side-to-side and diagonally, he or she can quickly and easily maneuver among people. Remote operation of UNI-CUB has the potential to expand its value and functionality for people. Honda established operations in America in 1959 and now employs more than 40,000 associates in its North American sales, R&D and manufacturing operations with total capital investment in North America exceeding $22 billion. Based on its longstanding commitment to “build products close to the customer,” Honda operates 14 R&D centers and 19 major manufacturing facilities in North America producing a wide range of Honda and Acura automobiles, automobile engines and transmissions, Honda all-terrain vehicles, power equipment products, such as lawn mowers, mini-tillers and general purpose engines, and the Honda Jet advanced light jet, all produced using domestic and globally sourced parts.